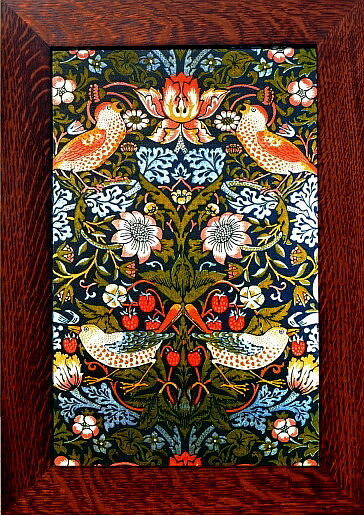 Inspired by watching thrushes stealing strawberries in his Oxfordshire Kelmscott Manor summer home kitchen garden, this Morris Strawberry Thief design became one of his most popular and recognized textile patterns. Morris began printing the design at Merton Abbey starting about 1883. The design was particularly popular on curtains, wall coverings and furniture covers. 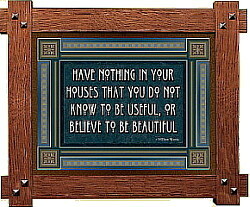 The print is 11� x 17� in a quarter-sawn oak frame that measures 14 �" wide by 20 �" high and includes a keyhole for hanging. 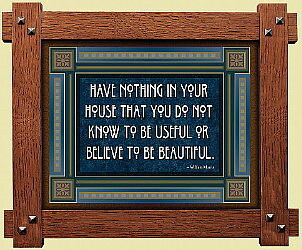 William Morris was born in Walthamstow London in 1834 and died in Hammersmith London in 1896. He was very prominent in the British Arts & Crafts Movement. Morris was friends with the famous architect of the period Philip Webb. Morris and Webb designed the famous Red House in Kent where Morris lived for a time. Later he moved to Bloomsbury in central London where he became a partner in a Victorian Period design firm. The company subsequently became Morris & Co which lasted until 1940. Many of Morris & Co designs are under license and still available today. 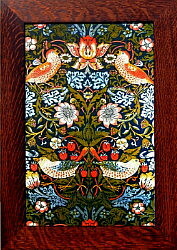 Morris produced many items used to furnish and decorate including wall-paper, fabrics, textiles and tapestries, embroideries, furntiture and stained glass windows. He also designed typefaces, designed ornamentation for his Kelmscott Press publications, wrote poetry, translated and authored books. Finally he matured as an active revolutionary socialist. We can say this Morris print is very USEFUL as period appropriate Arts & Crafts d�cor presented as a BEAUTIFUL museum quality giclee print framed in quarter-sawn oak.